​When I took a reporting job with the St. Catharines Standard in 2005, I wanted to live in Niagara Falls. The Cataract City was always a favourite day trip destination for my mom and me when I was growing up in Kitchener, so the idea of living there held the promise of endless fun. As it turned out, I rented a one-bedroom pad in an old high school in Fenwick and during my first weekend in Niagara, I didn't head to the eponymous falls. I made my way to the twin flight locks in Thorold to watch ships climb up and down the Niagara Escarpment. I sat for nearly two hours watching boats, fascinated by the ebb and flow of water that made the nautical thoroughfare known as the Welland Canal function. It's ironic, really, to think that I spent the first bit of free time I had in the region taking in something designed to bypass Niagara Falls. It had been about 17 years since the first and only other time I had visited the engineering feat that is the canal. My Grade 6 class stopped, likely not far from where I stood that day in 2005, so we could see how the locks worked after learning about them in class from a sepia-toned film strip. We were heading back to Kitchener after a day at Marineland where I rode the coaster at least a dozen times and felt uneasy about watching a killer whale perform for a crowd of school children. Watching a ship lurch along the canal was a sedate way to end the day. And yet, most of us were still enthralled as the enormous vessel deftly navigated into a narrow lock and lowered into the next leg of its journey between Lake Erie and Lake Ontario. Since our reintroduction 10 years ago, the canal has become one of my most adored spots in Niagara. It has usurped the Falls, for certain. Its status was further elevated last year during the countless hours I sat on a bench near Lock 1, where I now live in St. Catharines, watching boats pass while my infant daughter slept in her stroller. I got to know the regulars — the St. Mary's Cement barge, Algoma Central Corp.'s John B. Aird, Canada Steamship Line's Assiniboine. During the day, I would watch them glide to and fro, wave to their crew and wonder what life was like on board. At night, the hum of their engines became the lullaby that spilled through my open bedroom window and soothed me to sleep. The staccato blast of their horns was my alarm clock in the morning. Every day, I walked along the Canal Parkway Trail between Lock 1 and Lock 2 and when my daughter got to be around five months old — old enough, I determined — I'd pull her out of her stroller to take in the industrial monoliths floating past. If I was out running errands and ran the risk of missing our daily walk, I'd take a detour along the Canal Parkway. I'd pull over if I saw a boat so we could get our fix. Sometimes I'd bring snacks and when my daughter had become well-acquainted with solid food, I'd share them with her. There was one, in particular, she helped me devour with gusto. On a November day that felt like mid-January, we found ourselves in Port Colborne parked alongside Lock 8, sharing what was a most Niagara meal and moment. We had just come from another South Coast landmark: the red-sided retail headquarters of Minor Fisheries. I ordered the five-piece perch dinner, then trucked my feast and the two of us over to the lock to enjoy as a ship made one of its last trips of 2014 through the canal. While my eyes were fixed on the boat, hers were set on the takeout container sitting open on my lap. I offered her a piece of perch, certain she'd spit it out. She barely gummed it before she cast her eyes toward the fish to tell me she wanted more. I obliged, then offered a fry, which didn't stand a chance. I felt like the worst mom ever. She should be eating mashed peas, even an arrowroot cookie, I thought. But as she clasped my hand in hers to steer the fry I was holding toward her open mouth, I also felt like the best mom. I saw the joy she got from it; her first taste of perch and chips. It wasn't unlike the bliss that a trip to Niagara Falls once held for me, and what a few moments at the side of the Welland Canal now hold for us both. Tiffany Mayer is a freelance writer who lives in St. Catharines with her husband, their daughter and three felines. 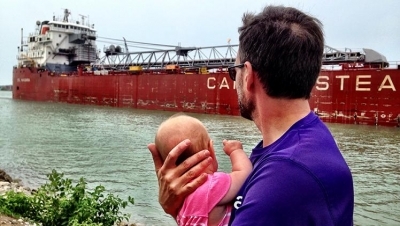 After 10 years in the region, she now knows the difference between a laker and a salty, thanks to that time spent near the Welland Canal. She is the author of Niagara Food: A Flavourful History of the Peninsula's Bounty (History Press, 2014) and blogs about food and farming at eatingniagara.com.